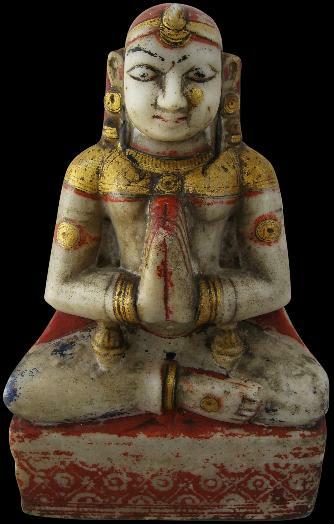 This image of a female devotee, in polychrome and gilded white marble, is almost certainly of a Jain worshipper. Possibly it is from a Jain temple where it would have been placed before or adjacent to a Jina image. The style of the dress suggests a Rajasthan provenance, which has one of India’s largest Jain populations. The figure is well endowed with jewellery, including prominent earrings, nose ring, bracelets, anklets, arm bands, and necklaces. She wears a red spotted head scarf that reaches from her head and down her back and she sits cross legged with her hands in prayer. Her full, rounded face is bordered by her earrings, scarf and two long black strands of hair which fall down the front of each shoulder – an unusual decorative element. Some of the polychrome and gilding has worn away but more of it remains than not. Typically images like this from Rajasthan are smaller and have lost more to their decoration.